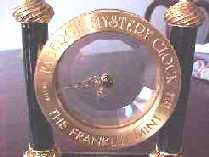 This is the Faberge Mystery Clock from the Franklin Mint and is dated 1988. Made in Switzerland. As in other mystery clocks, the hands appear to be suspended without any means of driving them. It is brass with 24k gold plating and black lacquer. There are 28 cultured pearls including 12 that indicate the hours. The minute hand is attached to one clear acrylic disc and is driven at the perimeter by a spiral gear in the left column of the clock. The hour hand is attached to a second clear disc that remains stationary. It is driven through two gears by the minute hand. The motor is in the base of the clock and is driven by a quartz crystal circuit. The clock is battery operated. Size is 8-1/2" high, 7" wide and 3-1/4" deep. Weight is about 10 lbs. This clock has the name LINDEN on the front of the base near the bottom. It is battery operated using one C cell. 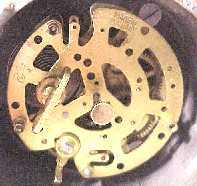 A quartz movement is located in the base. It has the name Rhythm Watch Company on it. 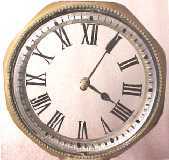 The clock appears to be cast metal with a shiny gold plating. The hands are thin shiny gold colored metal strips attached to separate clear plastic discs. The pointed hour hand is on the rear disc and is 3/16" wide and 1-1/4" long. The pointed minute hand is on the front disc and is 3/32" wide and 2" long. The two moving discs are held in place by a pin that passes through the center and then the front and back discs. The pin enables the two hand discs to turn freely and yet not transmit any weight to the driving gears below. A gold disc 5/16" in diameter covers the pins at the front and back. A knurled wheel recessed in the bottom of the clock is used to set the time by turning the minute disc which also advances the hour disc. The clock is 8-3/4" high. The dial ring is 6-3/8" in diameter and 7/8" thick. The ring is made up of a front and rear piece that are held together by three screws inserted from the back. The base is 3" in diameter. Height of the base in the front is 1-31/32" and in the back is 3-11/16". The clock weighs 838 grams or about 1.85 lbs including battery. This clock has the fancy letters ST on the triangular piece at the front. I have seen two of these clocks and they both have the same letters. There is no other name anywhere outside or inside but it may be a Seth Thomas clock. The base and ring are black plastic. The triangle at the front and back are plastic with a metalized coating that is shiny silver colored. The clock is battery operated using one AA battery. At first glance, the clock might appear to be nothing but a liquid crystal display that gives the appearance of having hands that move. However, closer inspection shows that the hands are thin shiny silver colored metal strips attached to separate clear plastic discs. The hour hand is on the rear disc and is 3/16" wide and 1" long. The minute hand is on the front disc and is 1/8" wide and 1-21/32" long. The two moving discs are held in place by a pin that passes through the center and then the front and back parts of a transparent plastic case that encloses them. The pin enables the two hand discs to turn freely and yet not transmit any weight to the driving gears below. A thin black plastic disc 5/16" in diameter covers the pins at the front and back. The black plastic outer ring has a front and rear section that snaps together. The front section of the ring has small 3/32" raised dots at the hours except for 12 o'clock that has a raised 1/8" square. Inside, the entire gear assembly is completely enclosed in clear plastic. This includes the hand discs and white gears below them. The clear plastic has a front section and a back section that snap together in four places around the perimeter of the hand discs and a small screw secures the lower portion around the white gears. The hand gears have 120 teeth and are 4-13/16" in diameter. There are two upper white gears, one behind the other. They both have 30 teeth and mesh with the hand gears. The two lower white gears are also one behind the other. They have 40,teeth. The top white gear drives the lower gear through a small 10-tooth gear near its center. That in turn drives the bottom gear and other gears that drive the hour hand. The white gears are driven by an electric impulse mechanism located behind them. At either side of the clock body are two weights. They are just on the inside of the case on either side of the lower white gear. These keep the clock from becoming too tipsy. Four screws hold the back of the clock in place. A thin felt piece on the bottom acts as a hinge so the back can swing down. The clock runs very accurately and requires one AA battery. A knurled wheel recessed in the back of the clock is used to set the time by turning the minute disc which also advances the hour disc. The clock is 7-7/8" high. The dial ring is 5-5/16" in diameter. The base is 1-5/8" deep. The clock weighs 339 grams or about 12 ounces including battery. This clock was supplied by Lakeside Ltd. Minneapolis, MN. This clock has a date of July 7, 1980 stamped in white ink on the bottom. A second clock has a date of January 30, 1984. 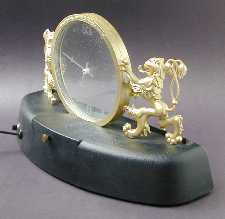 The outer clock ring and lion figures are plastic and painted gold. A push type light switch and the time set knob are in the back of the base. The clock is also illuminated. A fluorescent tube in the base shines through a cutout in the black plastic base at bottom of the discs. 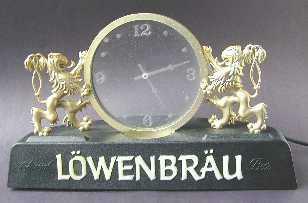 Light shines through slots in the base in front of each lion and also illuminates the name "Lowenbrau" at the front of the base. A three-conductor line cord in the earlier clock is 8 feet and 3 inches long and has a 3-prong AC plug at the end. The later clock has a 2-prong AC plug. There is no underwriters' approval anywhere on or inside either clock. The back of the base is curved. The clock is 8-1/8" high, 13-1/2" wide and 5" deep. It weighs 815 grams or about 1.8 lbs. The clock dial contains four molded transparent plastic discs. The front disc has recessed and frosted numerals at 3, 6, 9, and 12 o'clock with similar dots for the other hours. The second disc has a recessed and frosted minute hand and the third has a similar hour hand. The fourth is for protection. The hand discs are driven by gears and a motor in the black plastic base. The front and back discs are glued to the gold ring. A pin in the center passes through all four discs and supports the two hand discs. The black steel bottom plate is held by 6 screws. Four 1/8" thick rubber feet keep the screw heads from touching the mounting surface. The plate is painted white on the inside for light reflection. 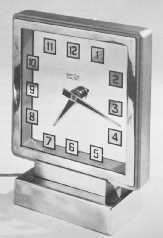 This is the Smith mystery clock made by Smith's Electronic Clocks. Patents for this design were issued in 1934. Operation is similar but not quite the same as the Mastercrafters #209 Mystery clock. There are 3 plates of glass. The front glass has black numerals on a square silver background with a black border. The rear glass holds the hand assembly. The middle plate has a hole in the center and is shaped at the bottom to allow it to be rocked slowly by a small roller arm connected to a synchronous motor. The motor is located in the base of the clock. The frame has a nickel finish. The top portion of the clock is 1.2" deep. The base is 2.7" deep and 4.9" wide. The motor operates on 220V 50 Cycle mains. Thanks to Joe at Collector's World in London for the pictures. The principle of operation for these two clocks is credited to a French inventor having the name of Robert-Houdin (1805-1871). He created many automata and mystery clocks and received several medals at various exhibitions. The clocks have two clear glass discs contained within a metal outer ring. One disc is stationary and has the hour and minute markings. The other has the only hand and is free to turn. There is no minute hand. The perimeter of the disc has a finely toothed gear. It is driven by a series of rods, worm gears and bevel gears connected to the movement, which is in the base. The tall neck of the clock at the left is a clear glass cylinder with a second clear cylinder inside. The central cylinder turns very slowly and drives gears that turn the hand disc. The driving cylinder does not go directly to the glass disc. The movement has been described as a twin going barrel with countwheel strike on a gong. The clock on the right is very similar in operation but has no glass cylinders. The two versions of this clock are described in "Collectable Clocks 1840-1940" by Alan & Rita Shenton, The Antique Collector's Club, 5 Church Street, Woodbridge, Suffolk, England. ISBN 1 85149 195 3. The value of these clocks is for their novelty and not so much for the makers of the movement or case. 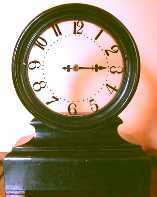 This is another double glass clock with the front glass having the hours and minutes on it. The rear glass has a single hand on it that is driven by gears from a key wind movement in the base. The movement with platform escapement runs gears that can be seen in the picture at the right. This is a view from the rear. The glass is attached to a large gear ring around the perimeter. The gears appear to be all brass. The clock is 10" high. The case is ebonised wood. 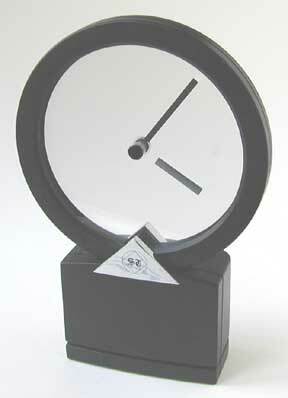 This clock appears to be a cheaper version of the Houdin clock described earlier. Unlike earlier clocks that have only one hand, this has a means of driving both a minute hand and an hour hand. 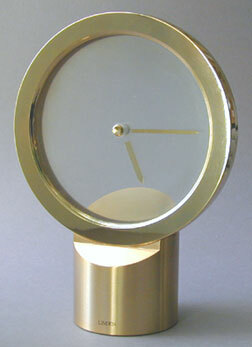 The hour and minute hands are on separate glass discs attached to a metal ring with gears. The discs are driven by a movement in the base. The front glass is beveled. The numerals and minute lines are painted on the back of this glass. The movement has "Made in Germany" stamped into it. The movement is also stamped with an oil lamp figure identifying it as made by the Hamburg-American Clock Company of Hamburg. The figure was used from 1882 to 1926. 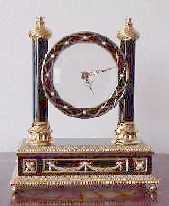 This clock was manufactured by the Hamburg American Clock Company. It dates back to about 1912. It has a key wind movement. The dial is 5-1/2" in diameter. The clock is 9-1/2" high and 7" wide at the base. The base is made of oak. Unlike earlier clocks that have only one hand, this has a means of driving both a minute hand and an hour hand. 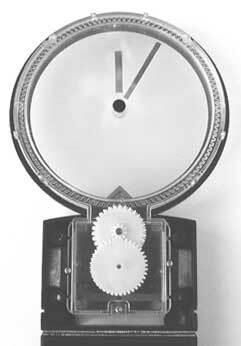 Gears at the center of the dial indicate that the hour hand may be driven by the minute hand. There appears to be only 2 pieces of glass. Although the name is French, the movement is signed by the Hamburg American Clock Company. Here's some of the gears inside the base. Photo courtesy of Bob at Proclocks. These clocks look very much like the other mystery clocks but they have a large windup mechanism in the center making it more obvious how they work. They are more like an ordinary windup clock. This is the LeCoultre clock. It says Sixteen 18 Jewels Unadjusted. This is the Imhof clock. on the back it says lever escapement--Swiss. A history of the Mastercrafters Clock and Radio Company. Includes pictures and descriptions of some of their clocks including a mystery clock. 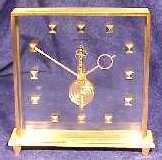 A major Chicago competitor to Jefferson that made similar mystery clocks and also animated clocks. Mystery clock page includes Etalage, Etalage Reclame, Sonic Industries Inc., Monitor Equipment Corp. MagiClock, Boots Boy and Rex Cole. Also known as projection clocks. A history of these interesting clocks from 1909 to present. Other pages I have created and personal information. Sorry, I don't know the value of these clocks. More text and pictures about mystery clocks will be added as my research continues. Any comments, corrections, or additions are welcome.